When my friend Dale Karls and I started Volume One in 2002, we never really thought of it as a business. And there certainly was no business plan. To us it was just a chance to pull together some friends, try our hand at a fun little project, and then put it out there to see what happened. Thankfully, we learned a few lessons fast enough that we were able to keep it afloat early on, make even more friends, and keep the whole idea alive and growing. 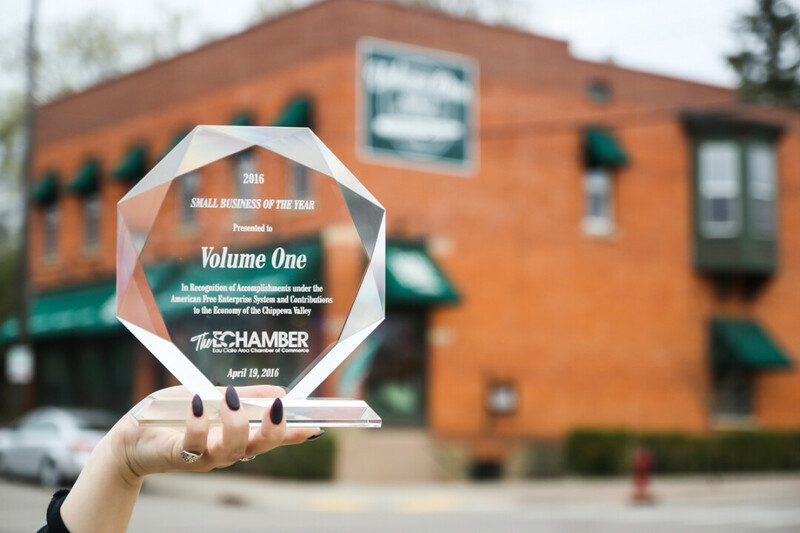 Fast forward through a slew of ideas and evolutions and just this April the Eau Claire Area Chamber of Commerce chose Volume One as the 2016 Small Business of the Year. I won’t be shy here – we’re pretty excited about this. It was quite unexpected when we were nominated from their pool of more than 1,200 member businesses, and it was an even bigger surprise when we actually won. For me, this kind of thing tends to have the effect of making me stop and think a bit. Since we first began we’ve grown to employ a team of more than 20 talented locals, created more than 300 issues, opened a rapidly growing store and gallery, and held hundreds of community events. All great stuff, and we’re certainly proud of these things. But none of it would have been possible without an amazing community there to support us for years in every way imaginable. We’re so thankful to the tens of thousands of people who read our work in print and online, to the thousands of local businesses who’ve chosen to invest in us, to the thousands of folks who choose to support us by shopping at The Local Store, and to the countless community leaders and thinkers who not only share our love of this region for what it is, but also share our vision for what it could be. Thank you so much. We’re honored to be a part of this place. If you’re interested, the Chamber holds a special breakfast event where you can hear a short presentation from the winners (we’re one of two, Royal Construction won in the larger small business category). That will be held at 7:30am at the Holiday Inn on Tuesday, June 7. You can register at www.EauClaireChamber.org. Hope to see you there!